When it comes to tournaments, there is an advantage for whomever is seated at the front of the boat. They often get the best angles to cast, and they are typically the first to cast at a target. However, that does not mean a co-angler cannot have a great day on the water. Two anglers who have had tremendous success from the back in professional fishing share their secrets and tricks. Out of all of their co-angler tips, their top tip is not a secret bait or strategy. It’s bringing an attitude. “Hey, you need to sit down and relax a bit.” Ron Fabiszak of South Bend, Indiana heard these words on more than one occasion when fishing as a co-angler in FLW events. He explains, “A professional can’t tell the co-angler to quit fishing, but that’s what he meant.” This has happened more than once to him. Out fishing a professional was not a rare thing for Fabiszak. In fact, in less than 50 events as a co-angler, he earned over $124,000 in winnings and boasts five tournaments wins. Fabiszak quickly points to his win on Falcon Lake in 2008 where his pro was focusing on submerged structure. As a general rule, Fabiszak avoids throwing to the same target as the pro, but he soon realized he was close enough to throw into emerged structure the pro was avoiding. He threw his senko in and ended up with a monster 28-2 pound limit and sat in first place after day one, then went on to win the event. Hensley agrees. She points out some obstacles are impossible to overcome, so you have no choice but to adapt. Hensley won the 2001 Stren Championship on Alabama’s Pickwick Lake by experimenting with the crankbait she and her pro were using. She recalls, “We were catching fish on crankbaits, but he was catching bigger fish. I kept switching until I threw a Bandit 100 and began catching bigger fish.” She is convinced that switching to that crankbait was the key to her success. Fabiszak acknowledges the biggest disadvantage is simply facing the unknown, “You don’t know what you’re going to be doing (once the tournament begins).” Plus, most anglers like to be in control while fishing and you lose that control as a co-angler. Again, success from the back for these anglers is not a mystery bait, technique, or even good luck. They stress versatility, but most importantly, attitude. Exhibiting exceptional mental toughness is the greatest asset to bring on the water. With all of the obstacles, droughts between bites are just part of the game. Hensley admits that when it gets tough, “I fish to my strengths.” She believes firmly that you should always follow your gut instinct. Fabiszak points out that co-anglers are forced to look harder. You have to look for structure the pro has missed while simultaneously learning from what the pro is doing. He advises, “Look for the little things. Often it’s the little things that make the big things happen.” Learn to do this, he stresses, and you will become a better angler. Hensley and Fabiszak pay close attention to the details in their tackle such as line size, reel gear ratio, jig size, color, retrieve, and casting angles. They are prolific at observing what is working or not working for the pro and adjusting themselves based on what they observe. If it ain’t broke, don’t fix it; but if it ain’t working, don’t die with it. It is out of respect and strategy that both co-anglers refuse to use the same bait as the professional. Hensley points out, “Remember, you’re fishing used water.” She acknowledges, “Most pros are good enough to pick off the fish that will bite their bait.” So, if the pro is using a power approach, she may throw a finesse rig. But she may pick up from the pro that the fish are relating to wood, so she too would toss her finesse rig to wood. Fabiszak will even experiment with the same bait the pro is using but in a different version. For example, if the pro is working a ¾ ounce jig, he’ll sometimes toss a 1-ounce or ½-ounce jig with a different trailer or color. It is easy to conclude that their success as a co-angler is also derivative of their ability and confidence to toss a horde of baits in different situations: the very definition of versatility to the bass fisherman. Fabiszak and Hensley take what they learn from the professionals they fish with and apply them back home. They also apply their knowledge and experiences from home during these events as co-anglers. Becoming a more diverse angler is a process that never ends for these two. They both agree that to become better co-anglers there is not a substitute for time on the water. Both anglers fish often and participate in local tournaments close to home to refine and sharpen skills. When competing in the professional events, they made pre-fishing common practice. However, pre-fishing was never with the intention of locating fish, but to help determine what kind of tackle to bring on tournament day. Fabiszak will also stuff his tackle bags with extra reels, “If I feel I may need to adjust on the water, I’ll bring extra reels. This way I’m not bringing too many rods (which takes up lots of space), but still have the ability to change techniques.” Both anglers encourage others to bring baits that they are confident will work anywhere. Fabiszak coughs up, “I always have senko-type baits and finesse worms.” He confesses these baits work anywhere across the country. Hensley encourages everyone to gain as much knowledge of the body of water before arriving. She suggests using resources such as maps, magazines, and websites. This can further narrow down what tackle to bring. Both anglers are comfortable running their own boats in large events. Fabiszak was a professional in the Midwest Stren Series in 2004 where he logged two top 12 finishes. He also was a boater in the 1999 Michigan BFL series where he won the event on the Grand River. Hensley’s first experience as a boater came on Lake Erie in the Michigan BFL. She managed to cash a check. 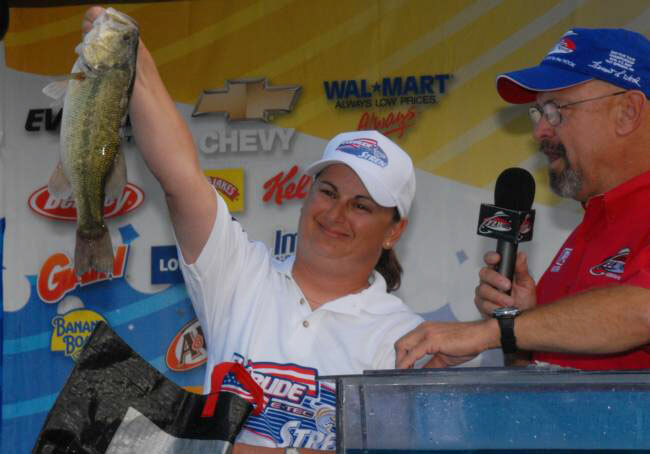 She also helped her co-angler cash a check for the first time despite not being able to practice. He also emphasizes that he thoroughly enjoys being a co-angler and recognizes that being a boater would add substantial stress. He isn’t willing to let that stress ruin the enjoyment he has fishing these events. So, quit relaxing and stand up! Whether you are running a boat fully protected by Megaware products or bumming a ride in the back, become a more versatile angler. With flexibility (and Megaware), you can experience the thrills of victory everywhere.